We are still proud of our roots and we still have traditional values at porky Down Butchers. We opened back in 1900 and are one of the oldest butchers in Devon. 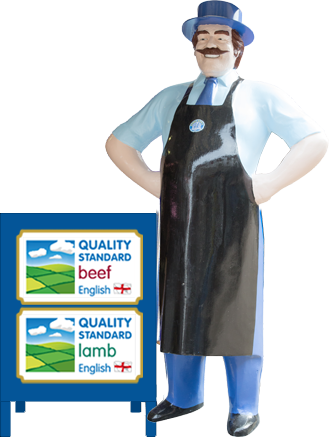 We are Exmouth's longest-established traditional butchers and have been providing quality meat and other local produce since 1900. We are an independent butchers, with a single shop in Exmouth's Magnolia Centre - look out for Mr. Trotter! The shop has remained family owned and run since the beginning, and we are fortunate to have such loyal staff and customers. We only sell quality, locally-sourced, free-range produce and pride ourselves on our customer service. Our meat has been awarded the Quality Standard Mark, so you can be assured of its superiority. Our traditional sausages and selection of pies use only the finest ingredients and are made on the premises. We also offer a hot-food service every lunchtime where you can sample our freshly-made hot dogs, burgers, pies, and meat baps. We supply meats, pies, sausages, burgers, and dairy food to the public and large business clients. Thank you for visiting our website. Please visit us or use our online order form for delivery throughout East Devon and the rest of the UK. Down & Son Ltd was established on Exmouth’s Exeter Road in 1900 by John Henry Down. The business later moved to its present location on Chapel Street which has been part of the Magnolia Shopping Centre since 1976. Our shop is easily identifiable by “Mr Trotter” who stands outside. © 2015 Porky Downs Butcher | 22 Chapel Street, Exmouth, Devon, EX8 1HS.